I talked a little about my sentimental hoarding problem back here on this post and I can say that one of my daughters has inherited this trait from me. I’m so sorry, Izy. She wants to save every single picture, note, and photo she gets. I think it’s super cute, my husband does not. She has a small magnet board in her room which is always covered 100% so now she has resorted to taping everything to her walls. Which, by the way, makes me think back to my bedroom walls as a 10 year old girl. I had New Kids On The Block posters covering every square inch of my walls. Haha! Tell me I wasn’t the only one?! Anyway, though taping things to the walls can be fun, I am trying to tidy up her room a little bit. So when I found this cork board at Hobby Lobby I knew this would be great at solving her problem. Since this board will hang above her dresser it needed to match the rest of her colorful decor pieces. So painting it was the way to go! 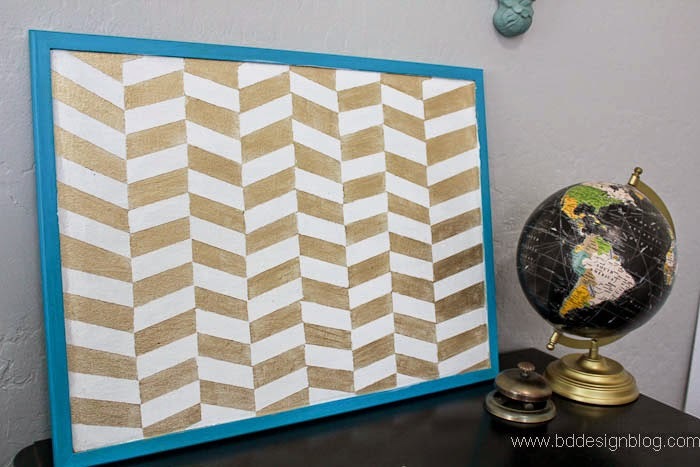 I painted a chevron accent wall in her room similar to this room. 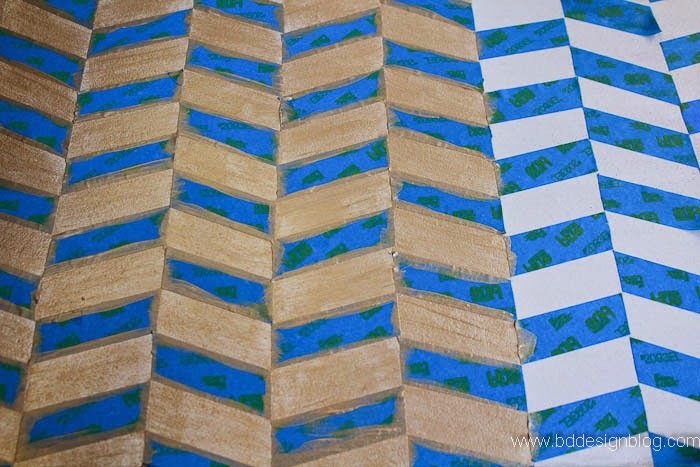 I chose the herringbone pattern because I think it is a nice compliment to the chevron pattern. I created the pattern by making a vertical pencil line every 2.5 inches. That really helped me to get the angles perfect. Then with short pieces of tape I connected the corners to the pencil line. Once I did the left side, I would tape the right side next. I think that made it more uniform. You repeat this step until you have covered your surface. Then use your craft knife and cut the tape to make perfect points. This process took me a couple hours to do because I messed up on the first go around. Turn on your favorite shows because you will be working on it for awhile. 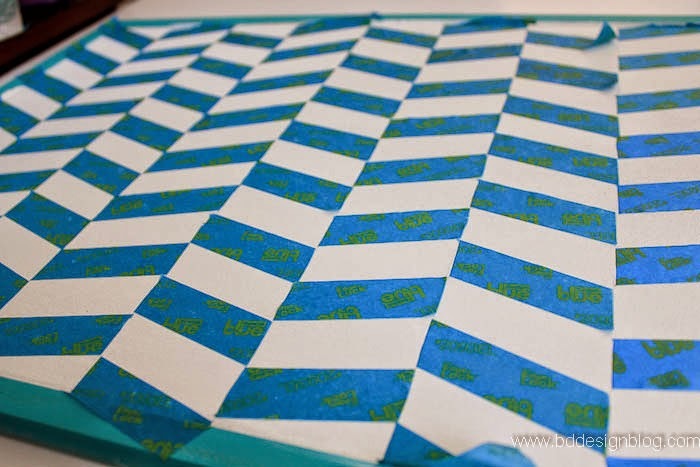 Once the pattern is finished, run your finger along all the edges to make sure the tape is firmly in place. Then paint over the tape. 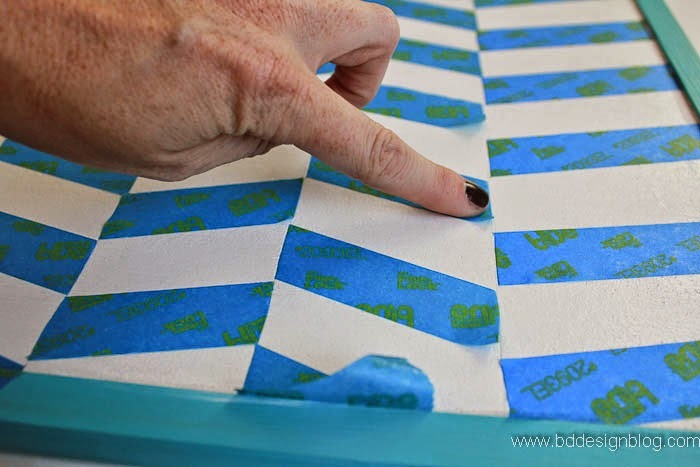 Now for my favorite part….remove the tape once the paint has dried. I don’t know why, but I love doing this this part! The shine from the gold paint makes the board POP! I love it. LOVE the herringbone with the GOLD!!!!! So fun and super on trend right now!!! LOVE THIS! 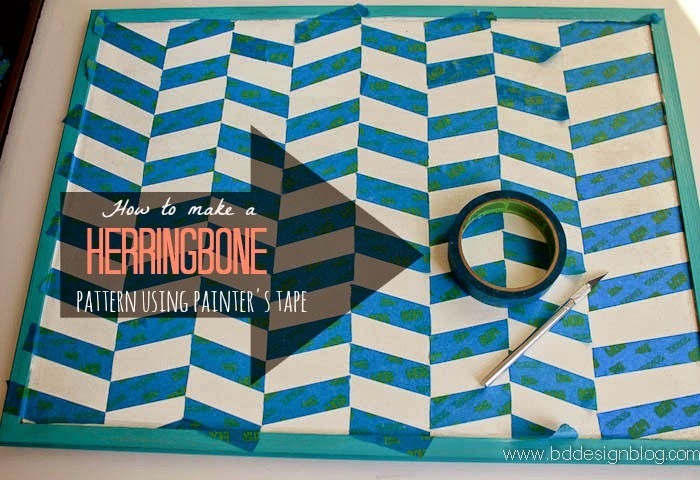 Herringbone is my fav : ) Such a cute blog! Great decorating idea! Thank you! 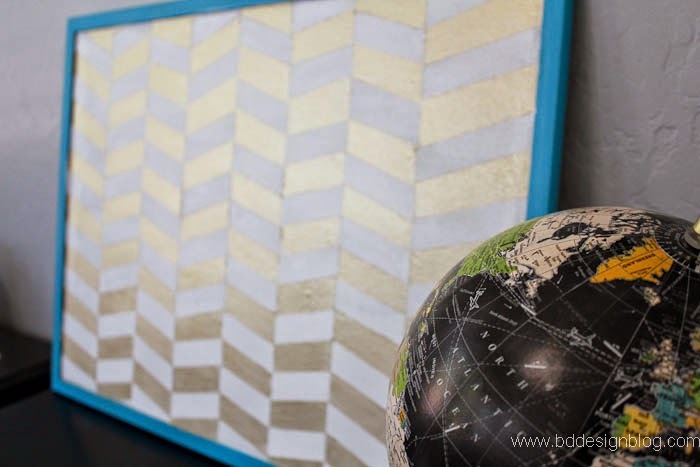 Such a fun project… Love the white/gold. This turned out great and I love the gold paint!